Lynn recently bought a 1960 ranch house and asked me whether I thought her wood parquet floors (small photo to the right) were original. Almost without a doubt I answer: Yes. The lead photo above is my dining room floor. This floor is original to my 1951 colonial-modern ranch. The parquets are each 12″ wide. They are made from fullsize pieces of wood flooring — this is not a thin veneer. In fact, somewhere in my travels I have heard that parquet flooring like mine was more expensive to purchase and install than the more common long runs of oak tongue-in-groove flooring. Wood parquet was more complicated, more fussy, and therefore, more expensive. The adjacent, step-down living room, by the way, got wall-to-wall carpet. How about another example of hardwood parquet? The photo above is from the ravishing Tennessee time capsule house (see the amazing kitchens and bathrooms). This floor was installed in 1956. Here is the foyer of the same house. We have explored recently what color stain is most appropriate for your midcentury hardwood floors — the mass, we believe, were done in “natural”, like mine. But it’s also great to see this darker stain. It is so rich and beautiful. Note, when I talked to the owner of this house who did the 1956 restoration, Mrs. Starling Davis, she explained that in 1956 “everyone was putting carpet” into the principal living spaces of their homes. This dovetails exactly with what we learned from Emily Morrow of Shaw Floors, when we learned about the history of wall-to-wall carpeting. This 1956 time capsule house was decorated top-of-the-line back 55 years ago. 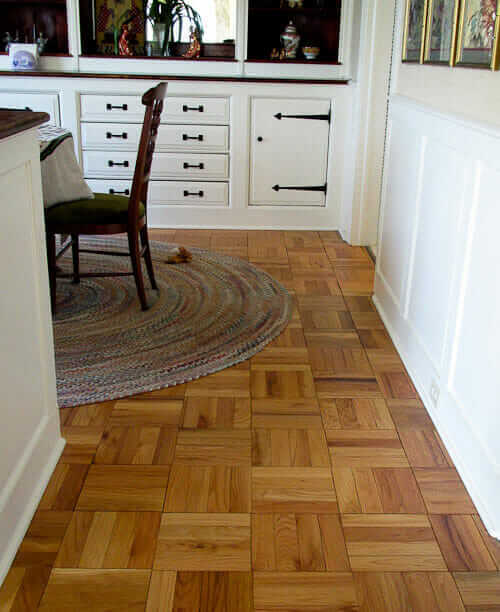 Parquet was used in key, “show off” places — the dining room and foyer — that functionally, could not be carpeted. Hence, I deduce: Wood parquet flooring was not only original and appropriate to midcentury homes, it was a top-of-the-line flooring choice. 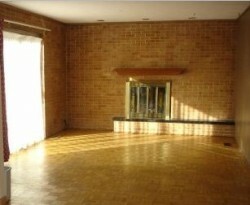 I live in a 1968 home with parquet flooring. It is in pretty good shape. But I am always wondering how to take care of it from weekly and if I am suppose to be finishing it. It has never been refinished and looks good. I have original 9×9 red oak parquet throughout my entire 1950s California ranch house. I am DESPERATE to find a good quality of replacement pieces. Water damaged ruined a sizable section of one room’s flooring and I’m heartsick about it. None of the modern parquet tiles on the market will work. Any guidance is very much appreciated. I don’t know… you may have to have this custom made? Yes, you do have to have it custom made. See all our flooring research — it’s in Kitchens/Flooring. For main living areas — how about cork? Or if you can find someone to do it — in Florida, the go-to most desirable floor would have been terrazzo. Could be even more spendy today than the real-deal parquet. Thanks for the investigating and the terrazzo idea. $10/sq ft is pretty expensive because we have about 1000 square feet to cover and it is unfinished and doesn’t include a new subfloor or installation costs. I’ll look into the terrazzo, which would be cool underfoot in the summer heat. You could also do VCT — if you like the casual look throughout the entire house… see our stories on Azrock VCT tile — TexTile and Azrock Cortina Autumn Haze — they have the old skool “jaspe” look. Even less expensive, probly: Armstrong Imperial Excelon VCT. Key to installing these floors successfullly is, I believe, getting the subfloor absolutely positively smooth; consult a pro. We have the same floors, pictured in the lead photo, in our kitchen. I love how the braided rug looks with it. Do you know where this rug can be purchased? Thank you! Beautiful home! Thank you for the information about the rug.